A bone specialist (also referred to as an “orthopedist”) is tasked with diagnosing and treating conditions related to the musculoskeletal system, which includes the muscles, ligaments, bones, and joints. If you’re experiencing any issues relating to your bones or muscles, you can place your trust in the experts at Tahoe Fracture & Orthopedic Medical Clinic’s Reno, Nevada, office. The first step toward recovery is an accurate diagnosis, and we’re proud to make state-of-the-art technology available for our patients’ diagnostic needs. For example, we provide our patients with the option of having an MRI completed in our innovative open MRI machine. This device is revolutionary in that it allows a bone specialist to position patients on a wide, rotating table (as opposed to traditional MRIs, which required patients to be enclosed within the machine during the scan), making it perfect for claustrophobic patients, pediatric patients, and more. Once a bone specialist has diagnosed your condition, he or she will work with you to create a treatment plan that’s geared toward your individual needs and lifestyle. Because Tahoe Fracture & Orthopedic Medical Clinic is a full-service provider, we can meet all of your treatment needs without you having to seek out a third-party practice. 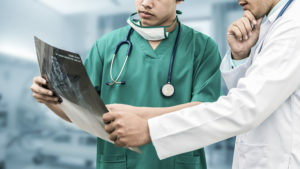 In many cases, a bone specialist will recommend that a patient attempt to relieve his or her symptoms through conservative means before turning to surgery. If your condition requires surgery, however, we have many experienced surgeons on our team who can work hand-in-hand with your physician to provide you with the best possible care. We also have physical and occupational therapists on staff who can assist you throughout the rehabilitation process, as well as physician assistants and nurse practitioners who can help you every step of the way. If you would like to meet with a bone specialist at our Reno, NV, office, please contact Tahoe Fracture & Orthopedic Medical Clinic today. We look forward to helping restore your function, mobility, and quality of life.